I will show you the "Bundesverdienstorden" or sometimes also called the "Bundesverdienstkreuz" of the Federal Republic of Germany. This decoration was issued on 07.09.1951 and signed by president Mr. Theodor Heuss. On the left side you find the ladies items. In the middle the miniature. On the right side you see the decorations for man. Diameter of the medal = 38 mm, by the miniature it is 16 mm. The ribbon is 30 mm, by the miniature it is 15 mm. The ribbon bar is 25 mm. The next class is coming soon. On the right side you see the decorations for men. Size of the cross = 47 mm for ladies, or 55 mm for men, by the miniature it is 16 mm. There is no ribbon for the cross because there is a kind of brooch for fixing. The miniature ribbon is again 15 mm. Is it the lighting or is the red of the crosses quite darker than usual? I think in case of different suppliers and production-lots (since 60 years), the color is always a bit different if you see 2 items side by side. The base-color-material, and the way of production has also changed during the times. The lightnig could be a problem. But the items are a bit different in natural. So you have good eyes for checking these products. The official discription of the color is RAL 3000 (should be similar). So this means usual? Your English is impeccable my friend. Below are mine, hence my question as to the red tone. Does the darker on yours usually denote an older or later award? I can find no maker's mark on any of the 3 displayed in my previous post. The Merit Cross 1st class and Merit Medal both came as is without a case. 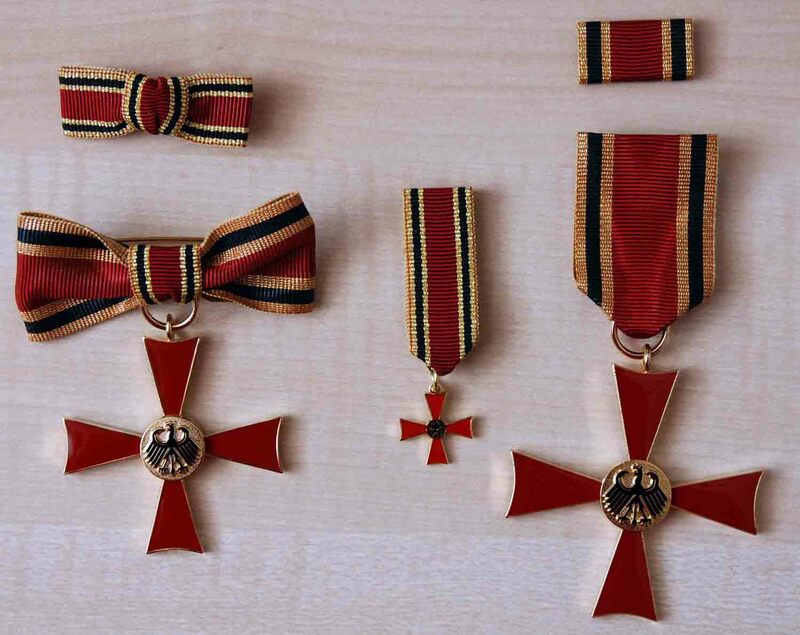 I also just noticed the marked differences in the ribbon of your and my Cross 2nd class. Is my cross on the wrong ribbon? Your 1st class and the medal are from Steinhauer & Lück. Your 2nd class from Juncker. 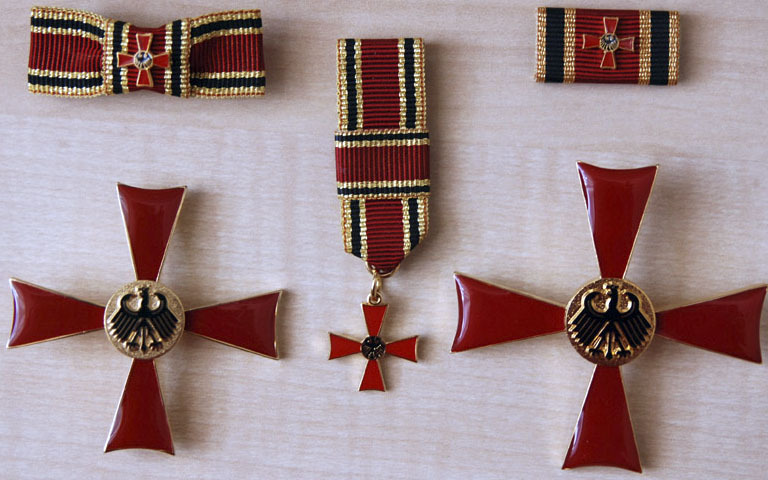 Some crosses with the clasp "50" are on the medal ribbon. So, it is all ok with your crosses. You get information from "red eagle" - he is an expert in this field. I think junker was producing in the 19fifties and 19sixties. Steinhauer is running with this product from beginng until today (arround 60 years). Both of them are not able to do it in the same style and color as bevor - during the time period. Your models are also older than the other ones, but yours are still correct. The "50"-year items is a bit seldom. Keep it in your collection. Thanks for that nice discussion. Here is my 2 cents. The scan is not good, but it does show the differences. The one on the left is cased by STEINHAUER & LUCK. 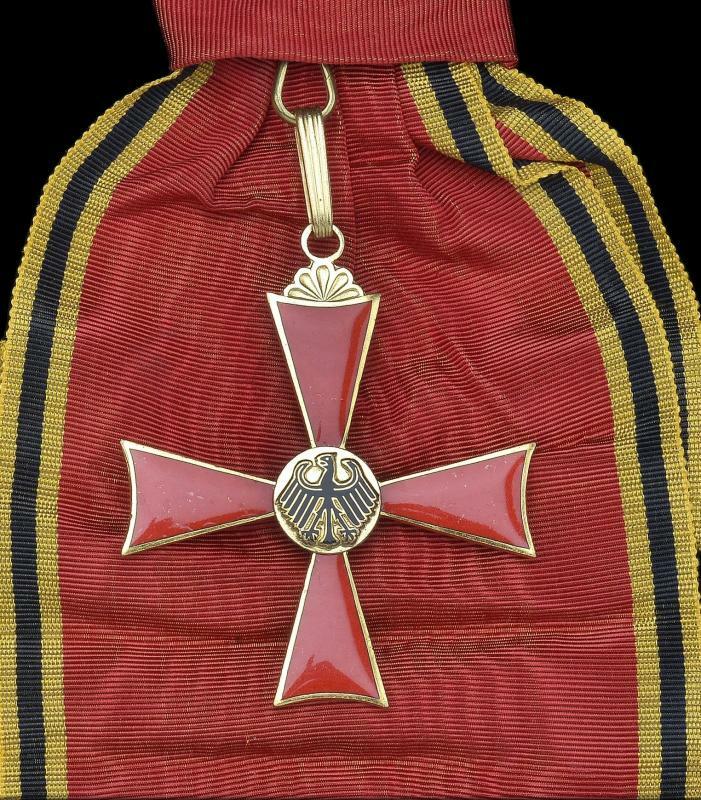 On my Website http://www.ordensmuseum.de , I add a rare award document and some new award numbers of the communal orders of the FRG. And your web site is awesome! It is now saved in my favorites. In my opinion, this cross was made by Bender. Its not an issued piece, because only St&L pieces be awarded actually. In what circumstance would this happen? Below is the latest addition to my collection. Looks similar with a Bender piece, too. Why were they issued on the medal ribbon? Any particular reason? This question, I ask to the Ordenskanzlei in the Bundespräsidialkanzlei. But they dont have a answer for this question. We know that this ribbon was issued. But we dont know some about an official reason. Well... I'm now seriously considering changing the ribbon... What do you think? Since few moths, I got a award document the the grandcross. My first one! Großes Verdienstkreuz mit Stern und Schulterband if I am not mistaken. The search continues... but at least I know what I am looking for after consulting your site, Uwe. 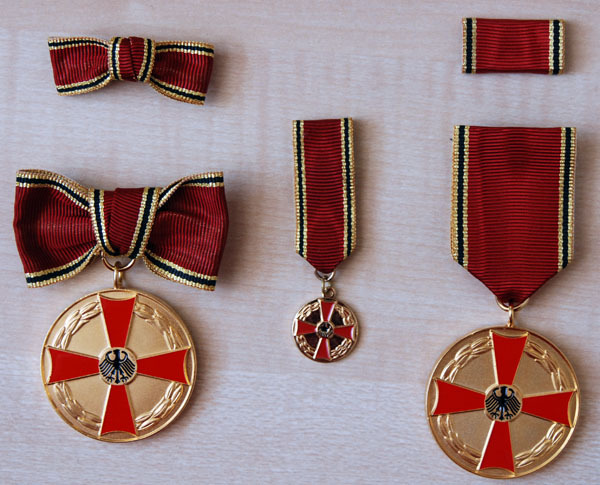 What are these awarded for? Merit or Valor? Also, can enlisted members receive these awards? 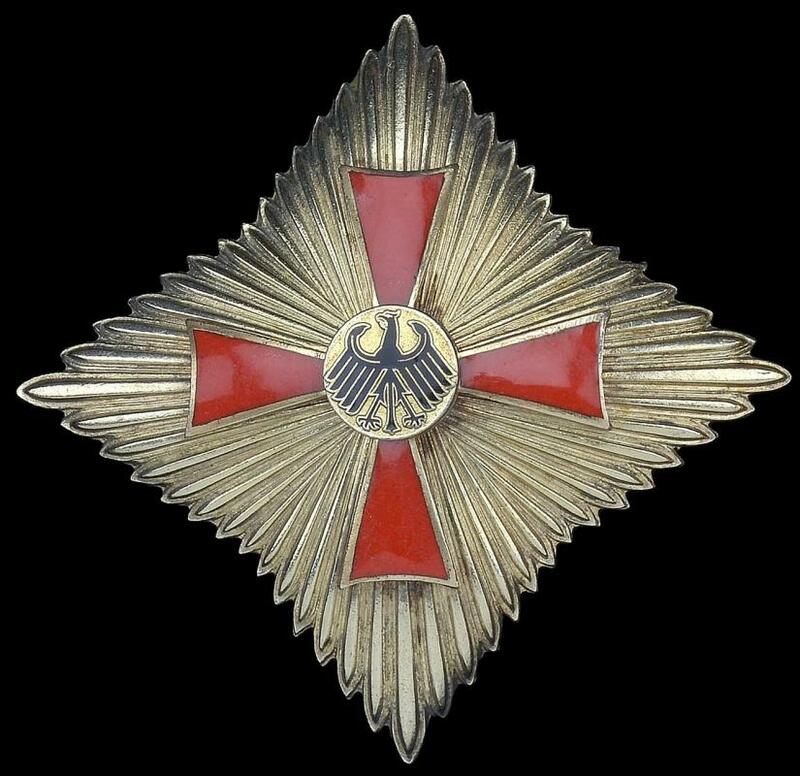 Usually high ranking officers (Generals) get the Verdienstkreuz am Bande or Verdienstkreuz 1. 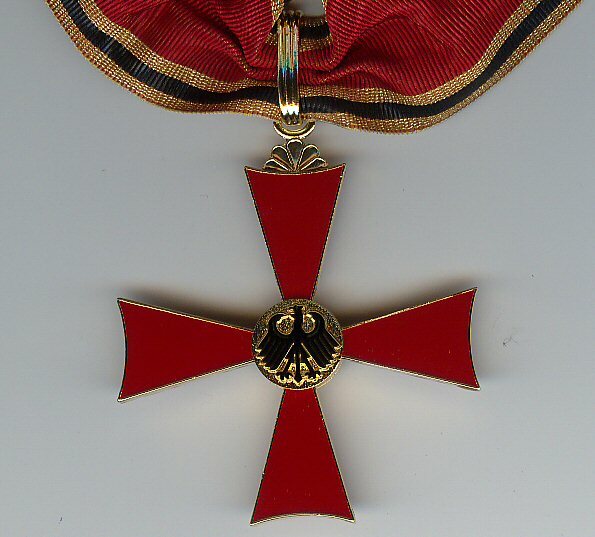 Klasse as a service decoration, but it´s not normally awarded to the armed forces.